President-elect Barack Obama formally announced Sunday that retired Army Gen. Eric Shinseki is his pick to be secretary of Veterans Affairs. Obama chose Shinseki, 66, over front-runner Tammy Duckworth, who many believed would be chosen as Obama’s secretary. A decorated veteran, Gen. Shinseki served two combat tours in Vietnam and lost part of his foot. Shinseki has been cited as an example by Pentagon critics who say the former Army chief’s advice was ignored in 2003, resulting in too few U.S. troops being sent to Iraq after the invasion.” The Washington Post obtained a private letter that Gen. Shinseki wrote to Donald Rumsfeld in June 2003 just before stepping down as chief of staff, in which he wrote that “Without people in the equation, readiness and transformation are little more than academic exercises.” The letter was never publicly released. On Meet the Press on Sunday, Mr. Obama said there is no one “more qualified” than Gen. Shinseki for the job. 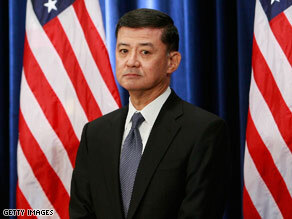 Shinseki, like Obama, is a native of Hawaii. Obama made his announcement about Shinseki on the 67th anniversary of the Japanese attack on Pearl Harbor. If confirmed by the Senate, Shinseki would control one of the federal government’s largest agencies, which administers health care and other benefits for the nation’s active military and veterans, as well as their families and survivors. The 240,000-employee department is the government’s second largest, behind the Defense Department. Disabled Vet Duckworth May Serve U.S.